On horse, on pony, with a donkey or in a carriage, an other way to cross the Monts et Lacs en Haut-Languedoc… at a walk, at a trot, at a gallop. Many professionals will suggest personalized circuits just for you or guided rides. At a walk, at a trot, at a gallop, who is going to hold the reins ? From 3 pm to 6 pm – 18€/children from 4 to 12 years old. Activity with parents. Pre-booking is requested. Rides and trekking on horseback – Training, course, review session. Boarding for horses all year round or by night t – Horsemen groups are welcomed – Rides with pony. 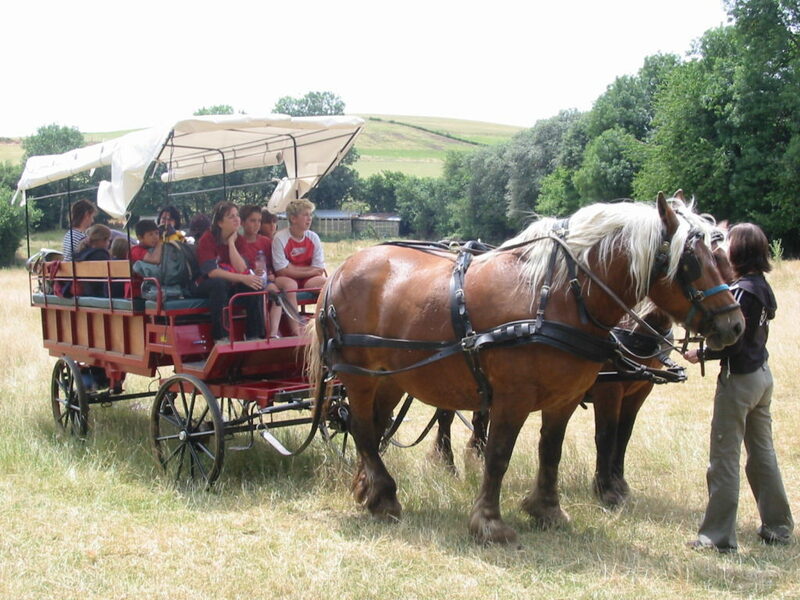 Western carriage (capacity 12 persons) with two “comtoise” mares. You will see 10 megaliths ans menhir statues. You will cross forests and shaded paths. Paths trough the forest, trails up to mountain ridge to be delighted with sceneries of the “Monts de Lacaune”, “the Larzac” and “the Grands Causses” . On July and August. Reservation requested. For all.